The Basic Laws of Israel (Hebrew: חוקי היסוד‎, translit. χuke ha-yesod) are the constitutional laws of the State of Israel, and can only be changed by a supermajority vote in the Knesset (with varying requirements for different Basic Laws and sections). Many of these laws are based on the individual liberties that were outlined in the Israeli Declaration of Independence. The Basic Laws deal with the formation and role of the principal institutions of the state, and with the relations between the state's authorities. They also protect the country's civil rights, although some of these rights were earlier protected at common law by the Supreme Court of Israel. The Basic Law: Human Dignity and Liberty enjoys super-legal status, giving the Supreme Court the authority to disqualify any law contradicting it, as well as protection from Emergency Regulations. The Basic Laws were intended to be draft chapters of the future Israeli constitution, postponed since 1950; they act as a de facto constitution until their future incorporation into a formal, unitary, written constitution. Israel as of 2018[update] functions according to an uncodified constitution consisting of both material constitutional law (based upon cases and precedents), common law, and the provisions of these formal statutes. According to Israel's proclamation of independence of May 14, 1948, a constituent assembly should have prepared a constitution by October 1, 1948. The delay and the eventual decision on June 13, 1950 to legislate a constitution chapter by chapter, resulted primarily from the inability of different groups in Israeli society to agree on the purpose of the state, on the state's identity, and on a long-term vision. Another factor was the opposition of David Ben-Gurion himself. Various bodies in Israel have called for the enactment of a formal constitution as a single document, and have submitted ideas and drafts for consideration. The Israeli Declaration of Independence stated that a formal constitution will be formulated and adopted no later than 1 October 1948. The deadline stated in the declaration of independence proved unrealistic in light of the war between the new state and its Arab neighbors. General elections were arranged on 25 January 1949, in order to elect the Constituent Assembly which would approve the new state's constitution. The Constituent Assembly convened on February 1949. It held several discussions about the constitution without reaching an agreement. For a number of reasons, Israel's first prime-minister, David Ben-Gurion, did not wish to create a constitution. After only four meetings, the Constituent Assembly adopted on 16 February 1949, the Transition Law, by which means it became the "First Knesset" The Knesset is, therefore, one of three sovereign parliaments in the world that are not bound by a codified constitution; the Parliaments of the United Kingdom and of New Zealand are the others. Because the Constituent Assembly did not prepare a constitution for Israel, the Knesset is the heir of the Assembly for the purpose of fulfilling this function. The Basic Laws do not cover all constitutional issues, and there is no deadline set for the completion of the process of merging them into one comprehensive constitution. There is no clear rule determining the precedence of Basic Laws over regular legislation, and in many cases this issue is left to interpretation by the judicial system. In 1950, the first Knesset came to what was called the Harari Decision. Rather than draft a full constitution immediately, they would postpone the work, charging the Knesset's Constitution, Law, and Justice Committee with drafting the document piecemeal. Each chapter would be called a Basic Law, and when all had been written they would be compiled into a complete constitution. Between 1958 and 1988 the Knesset passed nine Basic Laws, all of which pertained to the institutions of state. In 1992, it passed the first two Basic Laws that related to human rights and the basis of the Supreme Court's recently declared powers of judicial review. These are "Basic Law: Human Dignity and Liberty" and "Basic Law: Freedom of Occupation". These were passed by votes of 32–21 and 23–0, respectively. 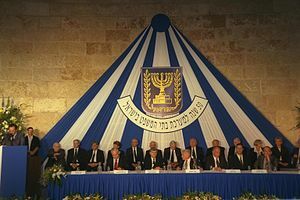 In 1992, Aharon Barak, President of the Supreme Court (equivalent to Chief Justice), declared a "constitutional revolution" and attached constitutional ascendancy to the Basic Laws of Israel. The Knesset enjoys de jure parliamentary supremacy, and can pass any law by a simple majority, even one that might arguably conflict with a Basic Laws of Israel, unless the basic law has specific conditions for its modification. Basic laws including specific conditions include article 4 of the Basic Law of the Knesset, on the system of electing the Knesset members, can only be amended by a majority of 61 of the 120 Knesset members; article 44, which prevents the amendment of the law by means of the Emergency Regulation, can only be amended by a majority of 80 members; several other Basic Laws also include an instruction regarding their permanence and protection from changes by means of emergency regulations. The Basic Laws on the government and on freedom of occupation can only be amended by a majority of the Knesset members. 1958; updated in 1987 The Knesset States legislative functions of the parliament of the state. 1960 Israel Lands Ensures state lands remain national property. 1964 The President of the State Deals with status, election, qualifications, powers, and procedures of work of the President of the State. 1975 The State Economy Regulates payments made by and to the state. Authority to mint currency. 1976 The Military Upholds constitutional and legal basis for the operation of the Israel Defense Forces. Subordinates military forces to the government, deals with enlistment, and states that no extra-legal armed force outside the Israel Defense Forces may be set up or maintained. 1980 Jerusalem Law Establishes the status of Jerusalem as the capital of Israel; secures the integrity and unity of Jerusalem; deals with holy places; secures rights of members of all religions; grants special preference with regards to development. 1984 The Judiciary Deals with authority, institutions, principle of independence, openness, appointment, qualifications, and powers of the judiciary. 1988 The State Comptroller Deals with the powers, tasks, and duties of supervisor of government bodies, ministries, institutions, authorities, agencies, persons, and bodies operating on behalf of the state. 1992 Human Dignity and Liberty Declares basic human rights in Israel are based on the recognition of the value of man, the sanctity of his life and the fact that he is free. Defines human freedom as right to leave and enter the country, privacy (including speech, writings, and notes), intimacy, and protection from unlawful searches of one's person or property. Any violation of this right shall be "by a law befitting the values of the State of Israel, enacted for a proper purpose, and to an extent no greater than is required". This law also includes instruction regarding its own permanence and protection from changes by means of emergency regulations. 1994 Freedom of Occupation Guarantees every Israel national or resident's "right to engage in any occupation, profession or trade". Any violation of this right shall be "by a law befitting the values of the State of Israel, enacted for a proper purpose, and to an extent no greater than is required". This law also includes instruction regarding its own permanence and protection from changes by means of emergency regulations. 2001 The Government Overturns its own 1992 edition, and restores the 1968 system with some amendments. 2014 Referendum Establishes that if the Israeli government adopts a decision or signs an agreement stipulating that the laws, jurisdiction, and administrative authority of the State of Israel will no longer apply to a certain geographical area, such agreement or decision must either be adopted via a treaty approved by 80 MKs, or by an absolute majority vote in a referendum. This means that Israeli sovereign territory (East Jerusalem, Golan Heights and any land within the 1949 armistice lines), under Israeli law, can only be relinquished either through a treaty approved by over 80 MKs, in which case a referendum is not necessary, or before a treaty is valid, it must be approved by an absolute majority vote in a referendum. 2018 Nation-State Defines Israel as the nation state of the Jewish people. ^ "Basic Laws". knesset.gov.il. Retrieved 16 June 2018. ^ Gross, Aeyal (1998). "The Politics of Rights in Israeli Constitutional Law". Israel Studies. 3 (2): 80–118. ^ "Q&A on the Override Clause". en.idi.org.il. Retrieved 22 August 2018. ^ "Basic Law: Human Dignity and Liberty". Retrieved 3 January 2014. ^ Gavison, Ruth (1985). "The Controversy over Israel's Bill of Rights". Israel Yearbook of Human Rights. 15: 113–154. ^ Dorner, Dalia (1999). "Does Israel Have a Constitution?". Saint Louis University Law Journal. 43: 1325–1366. ^ Orit Rozin "Forming a Collective Identity: The Debate over the Proposed Constitution, 1948–1950", Journal of Israeli History 26 (2), 2007, p. 251. ^ "Declaration of Establishment of State of Israel". Mfa.gov.il. 14 May 1948. Retrieved 19 May 2015. ^ "Israel's Documented Story: Who Needs a Constitution?". Israelsdocuments.blogspot.com.au. 25 April 2013. Retrieved 19 May 2015. ^ a b "The Constituent Assembly". Knesset.gov.il. Retrieved 24 April 2012. ^ "Israel's Supreme Court & the Power of Judicial Review". Jewishvirtuallibrary.org. Retrieved 7 May 2017. Basic laws functioning as a constitution. ^ "Basic Laws - Introduction". The Knesset. 2016. Retrieved 7 May 2017. ^ Harkov, Lahav (12 March 2014). "Knesset passes first Basic Law in 22 years: Referendum on land concessions". The Jerusalem Post. Retrieved 22 June 2015. ^ Harkov, Lahav (12 February 2014). "Bill reinforcing referendum on peace talks moves toward final vote". The Jerusalem Post. Retrieved 19 May 2015. ^ Wootliff, Raoul (18 July 2018). "Israel passes Jewish state law, enshrining 'national home of the Jewish people'". The Times of Israel. Retrieved 18 July 2018. Cohen, Asher; Bernard Susser (2000). Israel and the Politics of Jewish Identity: The Secular-Religious Impasse. Johns Hopkins University Press. ISBN 978-0801863455. Jacobsohn, Gary J. (1994). Apple of Gold: Constitutionalism in Israel and the United States. Princeton University Press. ISBN 978-0691029535. Mazie, Steven V (2006). Israel's Higher Law: Religion and Liberal Democracy in the Jewish State. Lexington Books. ISBN 978-0739114858. The Existing Basic Laws: Full Texts (English), the Knesset (Israeli Parliament) website, official translations - NOTE: The 1968 Basic Law: the Government translation is missing provisions, probably amendments added later on. As opposed to the 1968 and 2001 basic Law: the Government translations, the 1992 Basic Law: the Government uses the term "Acting PM" to refer to an "Interim Prime Minister" as well. The 2001 Law, which is in effect, present all provision in the translation, however, there are some lines missing. It is recommended to use the Hebrew laws official publications in the Knesset website.